Hep C is a blood borne virus that can cause long lasting liver disease. Hep C is spread from person to person through infected blood (even amounts you can’t see) getting directly into the blood stream. For drug users this means that sharing rolled bills for snorting or injection equipment for banging is a very risky activity. 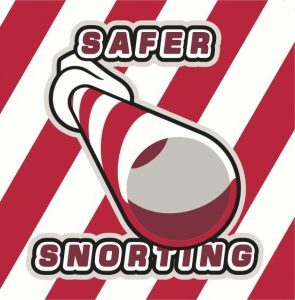 Snorting drugs can damage the inside lining of your nose causing it to become raw and irritated, even more so if you’ve been snorting repeatedly throughout the night. This can spread Hep C from one user to another. When snorting, tiny blood vessels inside the nose can break, and cause small amounts of to blood leak out (even if you can’t see any!). This blood gets transferred from the nose to the snorting device, then passed to the next person who uses the same rolled up bill, straw, etc. If you or someone you share bills or straws with has Hep C, you risk infecting someone or becoming infected yourself. It’s a wise idea to care for your nose. Rinsing the inside of your nose both before and after railing can decrease the amount of irritation you experience while snorting your drugs. It also means that you’re more likely to have two healthy nostrils rather than one big one, as some drugs can eat away at the division between your nostrils. By dabbing your fingers in water and sniffing it up your nose until you feel it run down your throat, you will help to move the drugs along and prevent nasal damage. After long nights of railing, you may want to consider applying Vitamin E oil to the inside of your nose in order to aid in the healing process. Most people who are infected with Hep C don’t show symptoms for the first while. Some symptoms may show up after 5 to 20 weeks after infection, others may not for many years. This is where you can run into problems, because it means that you may continue doing what you’re doing — sharing bills and straws — while infecting others, and perhaps not keeping your health in check. The good news is that Hep C is manageable. Although there is no vaccine for Hep C, many people live well with it. Lifestyle changes can help to manage chronic symptoms such as fatigue and depression. Eating well and chilling out on drug and alcohol consumption can help to keep the liver healthier. There is also medication available to treat the disease. Get vaccinated for Hep A and B, since these are two liver diseases that you can protect yourself from. Take care of your nostrils! They’re the only ones you’ve got! If you suspect that you have been infected, you may want to consider being tested for Hep C.
While Hep C tests are available, they aren’t entirely anonymous. Clinics will not ask for ID but you will need to provide a name (any name! IE. Mr. MDMA), in order to get your test results. Community Health Centres: Most CHCs can provide testing either through an appointment or through a drop in clinic if there is one provided. Dial 211 to find a CHC in your area. A Family Doctor: A general practitioner can provide these tests.